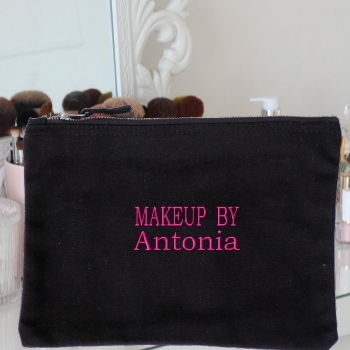 Personalised Makeup purse embroidered with text of your choice. Personalised Makeup purse embroidered with text of your choice. Black cotton canvas zip up accessories bag which is useful for makeup, cosmetics, toiletries, art supplies, traveling and more. Custom embroidered with a name, nickname or business name in a thread colour and font style of your choice.